Let us now take a look side by side comparison (well not side by side – it was just for a figure of speech). Anyway for an average consumerÂ computer user, he/she will automatically say that Maxis Broadband 3.6Mbps package Â > TmNet Streamyx 512Kbps. It is true when it comes to the download and upload speed. 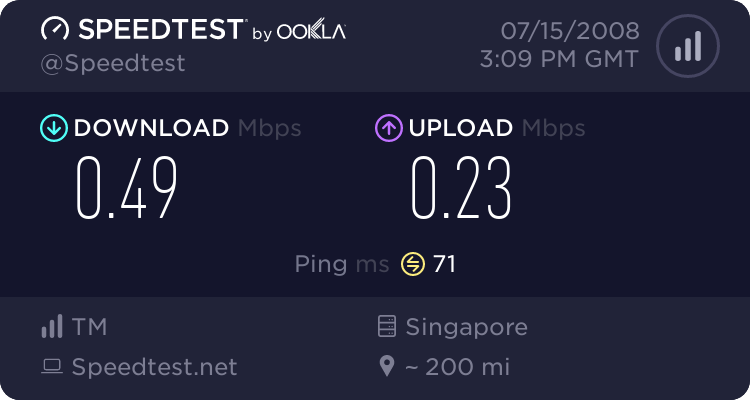 Do keep in mind that Wireless connection aren’t consistent , meaning that today you might good speeds and tomorrow your speeds might be sucky. This is because of the nature of the technology itself and also the carrier (wireless service provider) has toÂ prioritiseÂ between data and voice. Usually they’ll set the voice packets to a higher priority – in other words that if there are lots of users who are calling or using voice services in a tower , the data connection will be affected. Do keep in mind that a tower (Cell tower) can only cater up to 10 HSPDA Users at a time. This is another reason why Wireless Broadband users are complaining as their connection getsÂ interruptedÂ when theÂ transactionÂ occurs from HSPDA to 3G or wise versa. For gamers , you’ll never want to choose Wireless Broadband. Just take a look at my speed tests above , empathise on the term Latency . It clearly shows that my 512Kbps streamyx connection has a better latency then my former Maxis Broadband. An gamer should know by know that 300ms latency is bad (Heh , that is from Malaysia to singapore. Imagine it takes 0.3 seconds to say Hi). Of course an average user wouldn’t feel it but gamers certainly it would be bad. Especially when it comes to first person shooter. Another disadvantage is that just like the speed goes , the latency also is not stable. It may go as low as 70-80ms (for local connections) and high up to 1000-1500ms (for local connections). This is even bad when you’re planning to use Skype or any other application that requires a stable throughput and a low latency connection. This are the realitly facts of Wireless Broadband. I am not scaring anyone away or discouraging anyone. i am justÂ merelyÂ explainingÂ to you on what is it all about. On top of that , Wireless broadband such usually comes with a monthly data cap which is not suitable for kaki torrentsÂ (Heavy BitTorrent users) and those who of you who loves toÂ lurkÂ YouTube/Metacafe. So let me summarise it up and put it in points form so that it would be easier for you to take a look at it. I’ve generalised the whole thing and simplified it ! My Final Verdict : Â Wireless Broadband is suitable for people who don’t have any other choice (i.e No streamyx) or if you are always on-the-go person. As for you gamers out there or for heavy p2p users stay away from HSPDA/3G Broadband as there is a bandwidth cap that would discourage you from p2ping. Some mobile carriers (providers) have taken a step further by blocking all p2p connections and allowing to run only at a certain period of time. Maybe in the up-coming blog entry, I’ll be writing more on Wireless Broadband. Do stay tuned for it ! broadband services these days are getting and cheaper and faster too, very soon we would have an affordable Gigabit internet .